After publishing my most recent blog post on dialog and listening (LINK), I came across a very interesting quote on John Fea’s THE WAY OF IMPROVEMENT BLOG (LINK)(LINK). Using historical references, the quote by Reinhold Niebuhr, the great theologian, speaks volumes about where many of us find ourselves today. I also came across two very interesting Facebook posts that triggered me to post this a bit earlier than I might have; more about them after the quote. We have all supported immoral systems to one degree or another. This is unavoidable regarding the way governments and other forms of organization are operated. The United States has been, and continues to be party to any number of immoral policies and actions, given that each party’s viewpoint casts a different moral lens. Niebuhr speaks of the need to recognize that the people in such systems are rarely as immoral as the system. From this viewpoint, we have an opening to address those in systems that we oppose without demonizing them as people. Such demonization is seldom, if ever, a pathway to healing. We are in a time where there is a great need to have dialog across belief systems. Those who are aware of the dynamics involved need to take the lead in paving the way for such dialogs to occur. An example of the kind of dialog that can be started was illustrated on CNN the other night when Van Jones hosted a show, “The Messy Truth” (LINK) where Jones, a Hillary Clinton supporter, spoke with a group of supporters of Donald Trump. It begins with a willingness to listen, then, the ability to apply Niebuhr’s concept that the people are not as immoral as the system, to open the possibility of dialog. The other day, on my Facebook feed, a very long status update was shared that was, essentially, a rant about a division in a New Thought community that has remained unresolved. There was anger, woundedness, and, perhaps, a sense of despair. Each side made the other wrong, either by directly disagreeing, or by having their own set of facts. How often have we seen this in our New Thought movement? Another Facebook post recently got my attention. A spiritual leader posted that they had been told that they were not very competent at their job (unclear which job, or from whom the comment came). There followed a long string of comments that could be boiled down to this: Oh no! Only you can determine your competence, do not listen to anyone else. My thoughts at the time, without knowing the situation fully – I was limited to the Facebook post – were: REALLY? What if the assessment was accurate? What if the person was incompetent and needed to improve? What if the comment came from a mentor or a trusted friend? How would the outpouring of sympathetic comments all taking the position that the corrective comment was wrong help in any way (not one suggested that the person take a look at themselves and see if there was validity to the comment)? The Green level of existence (Spiral Dynamics™ LINK) puts feelings ahead of outcome, which can result in a failure of leadership. Too often, no one is held accountable if it might make them or someone else feel uncomfortable. No one can be corrected or criticized, so dysfunction is enabled, even encouraged. I would suggest that a spiritual community which enables dysfunction would fit Niebuhr’s definition of an immoral system. Again, we must remember that the people in that system will tend to be less immoral than the system itself, but that the system is also the creation of those present. The only way out of the dysfunction is through championing and enabling of accountability and integrity – and that will likely involve upsetting and disturbing some people who are either convinced that they have the moral high ground, or who are in denial about their complicity in the immoral system. This is a way of thinking and being that cries out for sacred disruption to a new level of being in the world. The spiritual lesson here, I believe, is that when we in New Thought are willing to develop the skills and abilities to heal our own house(s), we will become a more effective force for healing in the world. When we focus on things like the development of emotional and spiritual intelligence – and hold one another accountable from that way of being – we will be transformed. And when we are transformed, we will express what we truly are – a mighty moving force for healing on this planet. As this political season in the United States moves into the final stages, I can see, even from my current perch in Europe, that many people have been tugged across the line of spiritual and emotional poise into a very dark place. We are bombarded with the news, which can be bad enough, but also with all kinds of media, social and otherwise – from attack ads to Facebook memes, that are designed to get us to react emotionally. We are, apparently, supposed to love one candidate so unconditionally that we are immune to their failings; and hate the other(s) so unconditionally that we are immune to any positive characteristics that they may have. We are sold fear – over and over and over again. This is because it tends to work. Human beings, especially those without a mature spiritual foundation and self-identity, are very prone to being motivated, driven even, by fear. And there is SO MUCH TO BE AFRAID OF!!!!! Or many would have you believe. If there is an advantage to being in a New Thought Teaching at a time like this it is that we believe that fear is something to be overcome – that there is a greater Truth that is based on love and not on fear. Further, that each of us is our own authority – that we have true agency in this life. Our good is dependent on no other person, place, or thing. That one mind, alone in a consciousness of love, constitutes an absolute majority. Students of New Thought teachings have what it takes to stay grounded at times like this. So I do not hate Donald Trump, or Hillary Clinton, nor any other candidate for office. I do not fear them, for they have no real agency over me. Instead, I look to making the decision about who to vote for based upon which candidate or candidates seek to influence the world in ways that are the most congruent with my worldview. That choice is actually very easy in this election. I do not hate the candidates who are not in congruence with me – what would be the value in that? I do not hate the supporters of the candidates who are not in congruence with me – what would be the value in that? When I hate (or love irresponsibly – as in adoration) I am not coming from healthy aspects of myself – I am coming from Shadow – the elements of myself that I have repressed over my life because I came to believe that they were not likable or lovable. When I come from Shadow, I make bad decisions, I see things from fear and anxiety, I see things as black or white and lose sight of those innumerable shades of gray that make life so interesting and filled with possibility. As you get in touch your feelings regarding this election, what do you feel? Are you clear or in turmoil (emotionally)? Are you able to get a healthy distance or are you in the midst of the swirling drama? Are you in fear? What is driving your focus? Are you spiritually clear or in a state of confusion, perhaps not about what choice to make, but about the whole situation surrounding the election? Are you engaged or have you withdrawn? Can you see the perspective of those with different opinions than you, or have you shut them out? What spiritual practices can you do around anything on this list that concerns you? I like to think of elections as job interviews. I, the CEO of my own citizenship, get to select who will be the next president (or whatever). My vote is not the only one to be case, but it is mine alone to cast. The election process is a job interview and I know that there will be a lot of distracting stuff expressed by the job applicants, about 90% of which has no real meaning to me. I can also realize that the electoral process is a product of the overall consciousness of the nation. While not “less than” the consciousness at which I operate, it is certainly different. So the candidate options are not likely to be fully in harmony with my own desires. Can if find one who is closest to what I see as a positive way forward? Is there a clear choice between the worldviews of those in the election at each level of government? Again, I would say yes, from my own perspective. And in fact, once I am clear about my decision, I can, if I so choose, simply stop paying attention to the “application process” that we call a campaign. There is really no need to continue to pay daily attention . . . UNLESS my fear and anxiety are more about who others will vote for than for whom I will vote for!!!!! But no, let me set such feelings aside. And then, I can do my spiritual practices. So vote or choose not to. Refuse to let the spin around this or any election lead you to abandon the love that you are. Exercise your civic responsibility and privilege as a spiritual practice. For a guide to surviving and thriving in the election process, see my previous post on Affirmations for the Election Season (LINK). This post was inspired by a post in The Huffington Post Blog by Michael Meade (LINK TO POST) which speaks to the effects of multiple traumas on our culture. I thought that this eloquent piece added to what I have been saying about the importance of those in New Thought teachings to be acting from our principles in these times. In the post, called “Political Poison and Collective Trauma,” Meade, a philosopher, poet and mythologist (LINK TO HIS WEBSITE) speaks to the current situation of a world in turmoil due to the effects of increasing human complexity, including global warming and the current political climate, and the fact that so many are not adapting to that new complexity; so they scream for simple answers and look for messianic leaders to reassure them that everything will be alright. Those of us who have learned and practiced New Thought principles are especially well-suited to these times. The principle of the spiritual warrior comes to mind here. Not the immature warrior who destroys, but the warrior who defends what is of ultimate value. This arises in the mother who fiercely defends her child from danger; the citizen who stands for justice in the face of oppression; or the bureaucrat who speaks Truth to power. The spiritual warrior is a part of our collective human mythology. Her sword is the mythological tool used to cut away that which entraps her (the healthy destroyer). His armor is the protection developed from inner spiritual work – nothing said or done by another can cause him to waver. Joseph Campbell speaks of the spiritual warrior as the one who says “Yea” to it all – nothing is refused, if it is in front of me, it is mine to do. The spiritual warrior does not turn away from a challenge. The other element of the realized spiritual warrior is the transition of the location of the battlefield – from outside to inside. To use the warrior energy for the transformation the self. Only when we have done our inner work, when we have battled and then owned and finally come to love our shadow selves, are we ready for the return to the exterior battlefield with honor. We are no longer fighting our own demons projected onto others, we are fighting to defend what is truly valuable – so that our souls have a place to live our human experience in love and compassion. Until we have done that work, developed our psyche to be free of false projections and self-deception, we can only add to the problems of the world. We are called to step up to a greater role of love and compassion, to be exemplars of the highest and best within us. To bring the best version of ourselves to bear on the trials of our changing society. Many on a spiritual pathway tend to reject the idea of warriorship as being only of violence. But this is a mistaken notion. The warrior aspect in each of us is the archetypal strength to stand tall in the face of chaos, fear, and turmoil. When the inner work is done, the work of the warrior in the outer world is not violence, but the awakening and nurturing of the new way of being. The spiritual warrior is both the slayer of the old and the midwife of the new. So CALLING ALL SPIRITUAL WARRIORS to come forward and bring inner Light, Love, Peace and Power to a world that cries out for them. And CALLING ALL SPIRITUAL LEADERS to encourage your students to awaken the warriors within. Many thanks to Marjorie Shalita for bringing the post by Michael Meade to my attention, and my thanks to Mr. Meade for his wisdom and inspiration. In case you haven’t heard, there is an election going on in the United States. Of course, I know that it is pretty unavoidable; one would have to go to great lengths to stay fully unaware of what is going on. I have written a few posts on how we relate to politics as New Thought adherents. Here is a link to all of my recent posts that have mentioned politics (LINK). As I watch the videos from the conventions (I am in Europe and they don’t televise them live here), and read the news and social media, I find myself reacting emotionally. I react positively to those things I agree with and negatively to those with which I do not agree. That’s pretty normal, right? We all probably identify with one candidate or another, with some policy issues and not with others. And those reactions are emotional. We often post our reactions online, along with supportive materials either praising those who share our point of view or attacking those who do not. I have seen long “conversations” on social media between people who have strong opinions on one side or the other – or who are adamant about saying “a pox on all your houses.” People are blocked or unfriended for challenging another’s point of view; it can get pretty ugly. We in New Thought excel in a couple of things, one of which is the practice of self-examination. We come to understand that our thoughts and feelings are creating the consciousness though which we view the world and everything in it, so we also realize the importance of looking at our motivations, beliefs, and feelings. We recognize that unconscious beliefs can be destructive in our own lives and in the way that we interact with the world. Castaneda speaks to the issue of using a belief in a spiritual teaching to wrap ourselves in a cloak of superiority. It makes us say things like, “I would never do something like that,” which is the opposite of “There, but for the grace of God, go I.” Compassion cannot arise within a consciousness of separation, especially when that separation takes the form of a false sense of superiority. Simply put, how are you being and acting in this political season? If you take a moment to step back and do a personal inventory – maybe look at your Facebook timeline or Twitter feed – what do you see? Are you on the attack? Are you vigilant to make sure that nothing that you don’t agree with gets past you without comment? Are you flooding your timeline and feed with political memes or links to articles that people simply must read(!)? Perhaps you are doing an excellent job of behaving in a non-harmful manner, but are torn within with feelings of despair, anger, and even rage. If that is happening for you, what are you going to do about it? How are you going to steer yourself out of that raging inner sea? Are you going to attempt to justify your anger because others are acting in destructive ways (or might if they get elected)? If we do not work to cultivate our spiritual understanding – as Dr. Holmes notes, that is a belief in goodness that is greater than any apparent manifestation of the opposite – then what is the purpose of being in New Thought? Are we not taught to rise above such limited thinking through daily spiritual practices, spiritual education, and the conscious application of positive thinking in our lives? I have come to believe that our purpose in New Thought is to help to bring about a greater reality on this earth. The goal is to build and demonstrate a mindset that produces good acts, manifests our best selves, and promotes the concept of oneness in our lives. It is not that those with this knowledge are better than others, but in many cases, we do know better. The intention, therefore, is not to be in dominion over others, but to be living examples of what is possible – of kindness and seeing the world from a positive consciousness. That is enough. The old ways, which no longer work, are falling away. The old concept of adversarial systems, such as our political and criminal justice systems, which evolved out of the pre-traditional and Tradtionalist-Blue mindsets, and which were in sync with the Modernist-Orange level’s love of competition, have run their course. We can no longer thrive while being “against” others. This may look like the end, but it is a beginning. Our focus is not to challenge what is passing away, but to hospice it as it goes. And to midwife what is emerging as we understand it – a greater sense of oneness and connection that people everywhere are longing for. We are not responsible for the changing of one mind – only for the development of our own consciousness, so that we can act in a way that sets an example of what is possible. We do not have to make others wrong to get them to see what is right. What is right eventually becomes self-evident. I am not saying to refrain from being politically active. I am suggesting that to be politically active from a realized New Thought perspective is very different than from an ordinary perspective. Acting from a realized perspective means giving up the “energy fix” of being righteously angry at others; giving up the energy fix of sticking it to an opponent through humor or attack; of giving up entirely on the idea of “opponents” as anything that actually exists. It means really listening to those who disagree with your positions – as is explained so well in this blog post (LINK). It means bringing a consciousness of positivie expectation to political discourse of all kinds – and of not being attached to the outcome. The path forward is both complex and simple. It is complex in that there are many things to resolve as the human species evolves toward a greater realization of what is possible, and people will evolve in different ways and at different paces. It is simple because there is no place else to go. We are called to patiently shepherd our thoughts and feelings toward our divine nature, toward love and acceptance, toward forgiveness and praise, toward kindness and humility. That is the way forward. And if you need some help – here is the link to the Affirmations for Thriving the Election Season from a previous post (LINK). WE INTERRUPT THE SERIES ON GREEN AND ORANGE IN NEW THOUGHT TO BRING YOU THIS IMPORTANT POLITICAL ANNOUNCEMENT. The other day, in response to a fairly long thread on the Centers for Spiritual Living Ministers’ List-Serve regarding the shoulds and should-nots of ministers getting into politics from the pulpit, in class, and beyond, I took a stand for addressing the concerns of those coming to our ministries who are concerned and fearful in our current US political climate. Understanding and obeying the laws and regulations governing political speech and actions by religious organizations. 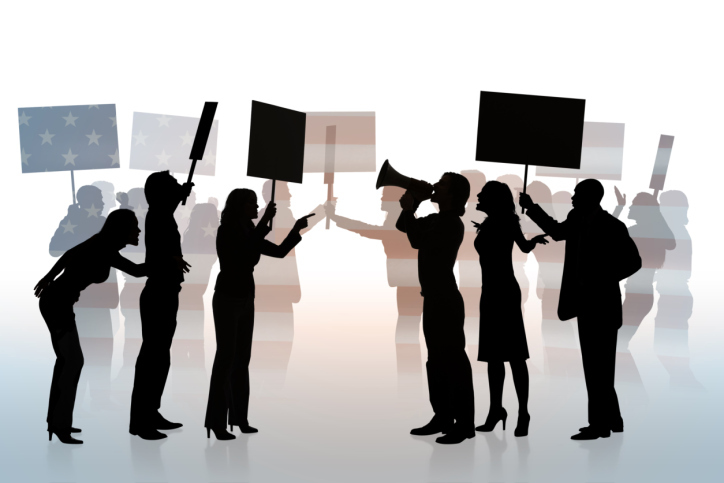 Concerns about taking sides, or being perceived as taking sides, on issues that are being debated in the political arena. Concerns about saying things that members of the audience may not agree with, leading to disharmony in the community and/or in people leaving the community. It’s been a while since I weighed in on any of the topics on this list-serve. I am speaking up now because I see that some of us are in a time of great confusion and fear around our political system and the current election cycle (in the US anyway). Those who come to our centers in person or via live stream are experiencing confusion and fear about an uncertain future – which is being fed by a media that is seeking ratings and readership and is therefore sensationalizing everything, by a blogosphere that contains a host of voices both sane and not, and by social media, which is filled with fear and often false or at least questionable information. If ministers in our organization shy away from anything seemingly “political” during this time, we are effectively turning our backs on those in need. The only things prohibited by federal law or regulation (LINK) is the direct support of or opposition to specific candidates and, apparently direct requests for support of or in opposition to legislation (I guarantee that this last one has never been prosecuted anywhere). There is no prohibition, legal or otherwise about taking stands on issues that relate to our principles, including making general statements about candidates without naming them. The Catholic Church and many of its representative clergy have gone on public record as saying that Catholics should not vote for any candidate who supports abortion rights. Since no specific candidate is named, that is no violation. Likewise, should clergy make a statement about preferring candidates who support peace or justice for example, without naming specific candidates, there is no violation committed. I am suggesting that to completely abstain from discussing these issues or others – having a civil discourse in the public arena for example – is to leave your audience to the media, the blogosphere and to social media. Where else are they to go? We have many statements in CSL’s ODM (Organizational Design Manual) relating to our global vision, shared values, and the way we are to be in the world. Member communities have vision, mission and purpose statements that speak to high principles and values. Surely this is a time to actually speak to and even act upon those principles and values; to make real the signs on the wall or the statements printed in your program by doing more than reciting them or ignoring them; by giving them life to light the way through the fear and confusion in these times of transformation. There has been mention in this thread of not wanting to say something that someone in the audience may disagree with. Really? What if they disagree with you when you teach that Spirit indwells each of us, or when you teach that each person is worthy of love and self-acceptance? Do you also not say these things for fear that they will disagree? What, after all, is the difference when you are speaking from principle? Standing for the principles of our philosophy is not taking sides, even though people may see those principles differently. How is one to “Live the Science of Mind” if we exclude their political life from the discussion – especially at a time when it is so front and center and so vibrantly contentious? I am not in the pulpit regularly any more, but when I am, I shall speak up for the principles of love, equality, freedom, civility, peace, social justice and others. I can’t think of a better reason to be thrown into prison. But we know that it won’t come to that, don’t we? That list-serve post generated some comment, but I am sure that many who may disagree with it kept silent. My desire is that we as a movement do not keep silent during these times. Our calling here is both to envelop those who are feeling wounded in this process, and to develop those who are ready to move forward in a spiritually principled manner. I am not saying that anyone should take a politically-based position and vocally support that from the pulpit; I am saying that spiritual leaders can and should help their congregations address their fears and concerns about the very relevant issues of the day in the most intelligent and principled manner possible. I am also not saying that one should be politically partisan – as noted above, spiritual leaders should speak to real-life matters in a principled spiritual manner. If some in the congregation object, be willing to engage in dialog if that seems like a productive pathway to greater understanding. But everyone will not agree with you on such matters because – guess what? – everyone does not agree with many of the things that you say now. Whether we like it or not, the current level of US political discourse is often harsh, offensive, and disturbing. Some may long for the days, just an election cycle or two ago, when the discourse, at least by the candidates, was more civil. There are two problems with that position: one is that you cannot go back in time; you cannot unring a bell. We are in this thing now, it is the way it is, and if healing is to occur, those who understand the process of healing must stand tall. Saying “it’s all good,” while true on the ultimate level, is not very helpful for most people right now. Likewise abstaining from any political involvement is itself a political action. Second, those years of more civil discourse often masked a system of governance that has been unfair, ineffective, and corrupt for some time. In fact, the anger of many Americans on both sides of the political spectrum is directly attributed to this – they feel that they have been lied to and ignored (even if in a more civil manner). And in some ways, the harsher discourse of this campaign season is giving voice to many of those people. We are experiencing the rush of released pain energy that has been bottled up for some time. The rightness or the wrongness of this is secondary – the expression is here and needs to be channeled as productively as possible. Your congregants need to know first how to get out of harm’s way, second how to thrive and be a healing presence by remembering the Truth, and third that they, being bigger than any problem, will survive whatever the outcome of the elections are. The often disturbing behavior that we are witnessing represents symptoms of a system that is ailing. And the revelation of symptoms is often the first step toward healing. In my opinion, it is essential to address the pain in the United States from a spiritually principled perspective – early, late, and often. In doing so, it is not necessary to use the rhetoric of the political world, in fact, that is not a good idea, since much of that vocabulary is so laden with emotional tags that using it will trigger the anger and fear that inhibits healing. And using that language will label the spiritual leader as in the fray rather than rising above it. It is more important to re-frame the issues from principles like Love, Peace, Power, Beauty, Joy, Light, and Life. Asking what would a spiritually aware, compassionate person do in regard to this issue. Asking your congregants to live more and more from their better natures and to build up their psychic immune systems to the fear that seems so prevalent in so many quarters today. As them to presence their highest and best selves through spiritual practice and by making your ministry a haven for civil and rational discourse on all topics. This election cycle offers many opportunities to engage your membership, and to invite the larger community into dialogue in a positive setting for those so inclined. Spiritual leaders need to know and follow the law on political speech and action. But to completely avoid the subject in times like this is, in my opinion, spiritual malpractice. ANGER IN POLITICS: IS IT A CALL FOR COMPASSION? As the political posts mount on Facebook and elsewhere, one of the first things that stands out to me is the anger that permeates so much of what passes for political discourse today. I know that there has always been an element of anger in our politics, and that much of it has been justified from the standpoint of ordinary consciousness. But now, it is something beyond that and is an ever greater challenge for someone with a spiritual consciousness. We have become conditioned, many of us, to reacting with anger to anyone and anything that represents a different point of view from our own. You can see this in social networking posts and in the dreaded region of the comments section of political websites and blogs. Some posts begin with anger, in others, it rises in the comments – often in comments that really have nothing to do with the original post. Of course, many politicians have used anger to their advantage, and many in the media have figured out how to tap into this anger, to amplify it, and in doing so to bring more people to their advertisers and to their political point of view. So what is this anger? Like all anger, it is an outer manifestation of inner pain. And like all anger, there is an element of self-direction within it – anger at yourself. And like all anger, the most appropriate way to deal with it is with compassion. If we only look at the supposed targets of the anger – in this case, politicians and fellow citizens who support politicians other than our own preferred politicians – we miss an essential point. We miss the essential core need of all humans – to give and receive love. In making his statement, he stepped outside of the usual and expected adversarial box of our competitive political system. Some pundits said that he only did that because he is not really a serious candidate – they could not imagine that he would voluntarily do anything that might help an opposing candidate. Others assumed that Sanders was being crafty and showing superiority over Ms. Clinton by defending her. Cynicism is the partner of anger. One could say that our political system is the cause of all of this anger – that politics has let us down in so many ways – and there would be some truth in that statement. But when we understand what anger is – the expression of inner pain – we begin to realize that perhaps we have co-created our political system in just this way to provide us with a channel for the anger and pain that we feel – anger at our own perceived inadequacies and failures, the pain we feel within ourselves – which we see reflected back to us by our politicians and by those on the other side of any particular issue. Many become convinced that their very survival depends on the acceptance of their political viewpoints by others and become enraged when others do not follow their wishes. And of course, there are many in the media and among the political consultants of our day who seek to use that anger to their advantage. Spiral Dynamics™ tells us that all of the 1st Tier levels of human values systems are fear-based. It is no wonder that many of these fears come to the surface around political issues, many of which are focused on issues of safety and security. My metaphysical and psychological studies show me that the only way to begin to shift this pattern of anger and politics is to begin by looking within myself. If I am seeing and reacting to it, it must have already existed within me. My Shadow self, the repressed aspects of who I am, is causing me to project my anger, my incompetence, my fears, my warlike self and other aspects of me onto those I encounter in politics. They then faithfully mirror all of this stuff back to me and I react without realizing the dynamic that is unfolding. Maybe I design a personality that appears to rise above the fray, but doing so just internalizes the anger. And I will continue to react to those with different political worldviews, becoming mired in the process of Shadow projection and denial. I hate that. Don’t you? But, I can do something about it, and so can you. But really, I can only speak to what I can and cannot do. I cannot do much about the worldviews of others unless they are willing to see things differently, but I can do something about my own inner processes. Every external and internal challenge to our equanimity means that something within us that we have not yet expressed, some strength, is ready to emerge. This collective anger at our political system can be seen as a calling forth of an inner strength of the American people – our compassion. Anger can either be channeled toward a positive outcome, or it can be transmuted into compassion. The latter is the spiritual path. The positive outcomes that we desire – a world that works for all, will not come about through collective anger, even if enough people had the desire, the skill, and the courage to channel their anger toward that end. So my path is toward compassion. What am I afraid of in regard to political outcomes? What am I afraid of revealing about myself? What is keeping me from seeing the humanity in others? Why am I so deep into judgement of others? What am I being influenced by in the outer world? Where have I given up my power of dominion in my own mind? When I think of the politician that I have the strongest negative reactions to – what inner dynamic is being triggered? Does it have anything to do with an authority figure in my life, past or present? When I think of the politician that I have the strongest positive reactions to – what inner dynamic is being triggered? Does it have anything to do with an authority figure in my life, past or present? What is keeping me from being compassionate toward __________ ? It is only through self-awareness that we move into a greater capacity to direct our own inner lives. It is through a realization that our reactive emotions are not really about what we are reacting to but are more about what we are reacting from. Until we heal those inner issues, we will not have dominion over our own experiences. When New Thought ministers speak about politics, too often we stay at the level of effect – at the surface if you will – where the conflicts exist. We may suggest that people either rise above the fray somehow or that they detach from engaging at all. When we do this however, we are unwittingly suggesting that our members stay firmly entrenched in their Shadow selves. At best, this simply postpones the inevitable need to cope with and embrace the inner Shadow issues. Such an approach can also invite spiritual bypass, which is using spiritual practices as a way to avoid taking a serious look at issues – just do a prayer-treatment for a perfect political outcome and turn off the TV and stop going to those political websites and all will be well! What we do not confront tends to grow. 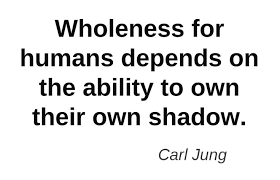 The Shadow process, viewed in the broadest possible way, is a mechanism for healing. We repress aspects of ourselves which then stay active in our subconscious. We then project these aspects onto others and deny that we are doing this (meaning that it is an unconscious process). Then we react to others from the repressed emotions and blame them for upsetting us. Becoming aware of this process, noticing when we are reacting from our own projections, opens the possibility of healing. It is not pleasant, but it is essential. And, by the way, this is also true for Shadow healing at the collective level – our collective American Shadow is being used to call us to heal – but first we will have to develop an awareness of what is happening. 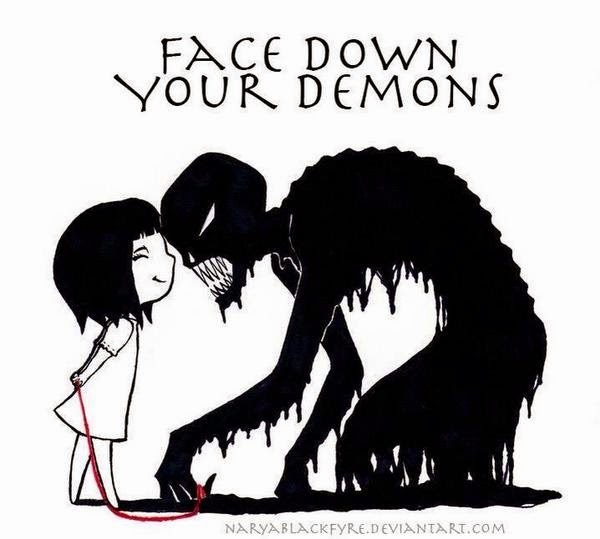 When we face our own demons, there is no need to project them onto others. My suggestion is to use this political season (still 12+ months until the election!) as a proving ground for your personal healing of any issues that are being projected into your outer experience. Remember, it’s not about the other person or party, it’s about me! Notice the negative feelings, the anger, the pain, the frustration, and sit with them for a bit. Review the questions for yourself from earlier in this post. When you see that these are not about the other, but are about something that you are carrying from a previous time, you are able to begin to heal. As you do this, you will find that you still notice the other political opinions, worldviews, policies, tactics and the like, but you are no longer triggered by them. Rather than getting angry, you may feel sadness or disappointment. Rather than engaging in arguments (even the ones you have with yourself when the other is not present), you are able to reach out, to connect, to create the possibility of reconciliation, or compromise; or you are able to walk away when that does not bear fruit. These are the hallmarks of 2nd Tier thinking, where fear is largely left behind. Imagine how you would be if you approached politics from a consciousness that is free of fear. Your inner life becomes more relaxed and loving, the harmful physical effects of pain and anger are no longer in your life. You can practice compassion daily for everyone in the political system – for all Americans – and for the whole planet. You can close the circuit of repression – Shadow activity – and healing through awareness of your own personal dynamics. Our compassion is being called forth from within us in this process and the future of the planet for our children and future generations is at stake – how will YOU respond as the political process moves forward?